Your Pie was recently featured in an article for QSR, where QSR discussed the unique experience that Your Pie provides for customers. In the article, entitled “The 6 Keys to Building a Great Hospitality Program”, QSR highlights the integration of a craft-beer selection into Your Pie stores as well as the exceptional customer service provided by employees that is not typically seen at fast-casual restaurants. Your Pie provides customers with a fast-casual dining experience that embraces a love for pizza paired with attention to detail. 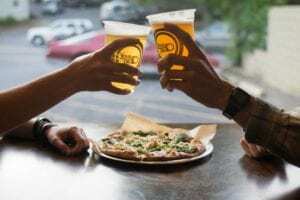 Although customers customize and order their meal from the front register, meals are delivered to each customer’s table and employees check-in on customers throughout their meal to see whether they’d like another beer or to ask about their meal. Your Pie respects the idea that fast-casual dining shouldn’t mean substituting great customer service or quality food and drinks. The experience at Your Pie truly is unique!